So I originally was going to make these to give to my neighbors the week before our housewarming party so that they didn’t hate us if/when we made a lot of noise. Unfortunately for them, I changed my mind after taking a bite of the blondies right after they got out of the oven and, instead, decided to keep them. My roommates were content with this decision. 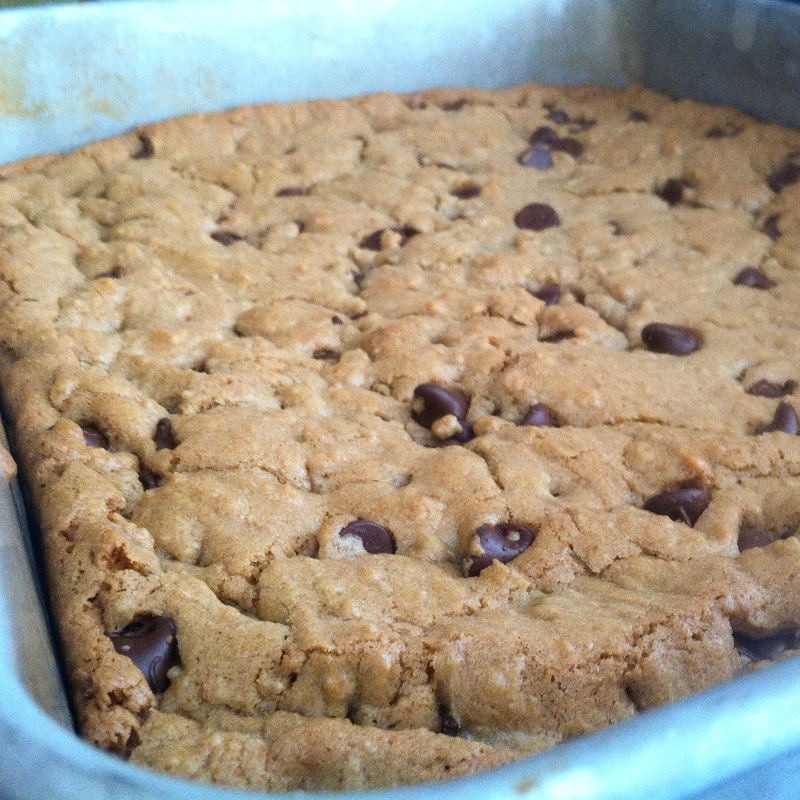 This may be because I used a 13×9 pan and the batter was spread thin, but the blondies resembled a thick, giant chocolate chip cookie. The batter does rise a little in the oven, but not as much as I thought it would. Next time I might try baking it in a 9×9 pan to make the blondes thicker. Preheat oven at 350 degrees and grease a 9×13 baking dish. Sift together flour, baking powder, baking soda, and salt into a medium mixing bowl. Set aside. Combine melted butter and brown sugar in a large mixing bowl. Add egg and vanilla and mix well. Add a third of the flour mixture and mix just until combined (don’t over-mix it). Repeat until all the flour has been added. Fold in chocolate chips. Spread batter into the greased pan. Bake for about 20-25 minutes or until a toothpick inserted in the center comes out clean.